A company's Mission Statement is an important reminder, to both visitors and employees, of the company vision for the future. These Corporate Mission Statement displays are a perfect way to display these ideas in any office space. Text/Images are digitally imprinted on a Silver HD or Gold HD Plate and mounted on a piano finish wood board, and accented with a bright metal trim. Mounting hardware includes caps, stand-offs, drywall anchors, and installation instructions. Also available in our Black Metal Plate. This Mission Statement Plaque - Rosewood RP-MS15EZG is part of our Mission Statement and Trademark Series of products, check out other products & options available in the Mission Statement and Trademark Series of our selection. 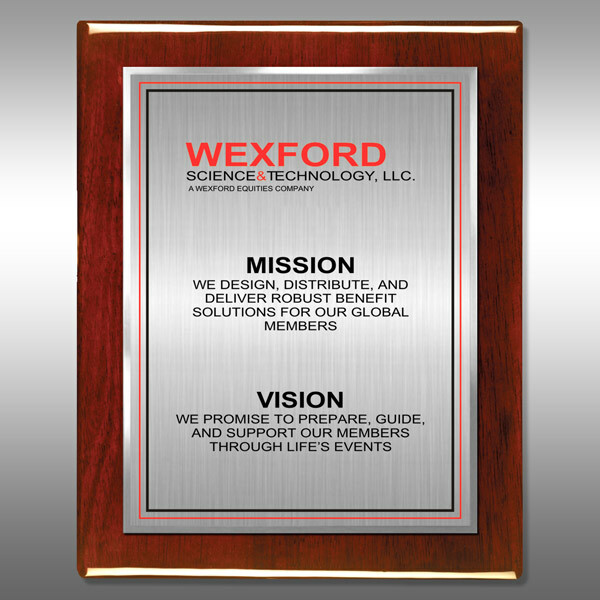 This Mission Statement Plaque - Rosewood RP-MS15EZG can be modified to your requirements and is available for your corporate award programs.